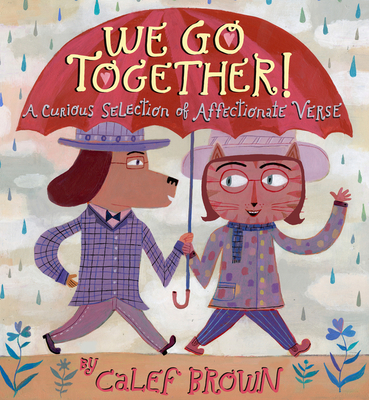 In Calef Brown’s poem “We Go Together,” he jubilantly decrees: “We go together / like fingers and thumbs. / Basses and drums. / Pastries and crumbs.” In “You Are Two (Kiwis),” he muses, “I am quite frequently, / reminded by thee / of a kiwi. / Either kind.” Yes, silliness and sentimentality have free rein in this “curious selection” of childlike poems about love and friendship, each accompanied by an equally absurd, stylized acrylic painting. Like Sandol Stoddard’s I Like You, We Go Together! this book makes an offbeat Valentine’s gift for anyone with a good sense of humor and a penchant for wordplay. "In a collection that celebrates loving friendship, Brown artfully captures the comforting, sometimes odd moments of true affection." "[Brown] pairs a heaping spoonful of nonsense with unexpected yet genuine observations about the joy of companionship." "The cheerful, rhythmic rhymes help make this book perfect for reading aloud, and it would be an ideal choice for two friends to share." "This small book, not much bigger than a greeting card, celebrates friendship in short poems and imaginative drawings. . . . Use this as a jumping off place for creating Valentine's Day cards."